Thai food has become one of my favourite international cuisines. And unlike French or Italian where there are many competent executions in various cities around the world, I find Thai food a bit lackluster when not in Thailand. 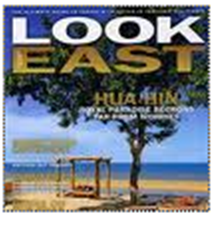 Don’t get me wrong, some places outside of Thailand do get it right, but they are few and far between. So we’ve decided to take matters into our own hands and make Thai food at home. I myself am a very comfortable and accomplished Western cook but I am unaccustomed to how to build the Thai flavour profiles. This is why whenever we go back to Thailand, I try to take a Thai cooking course to supplement my knowledge of Thai cooking. 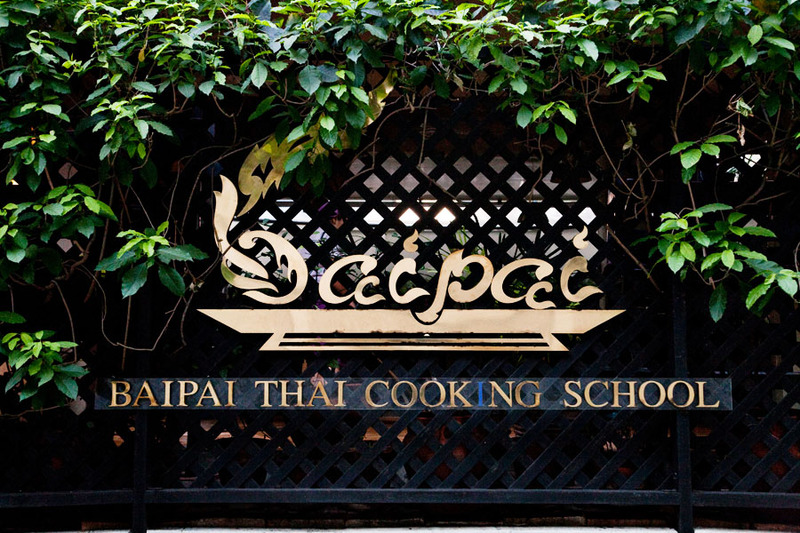 On our most recent trip, this was Baipai Cooking School in the Chongnonsee area of Bangkok. 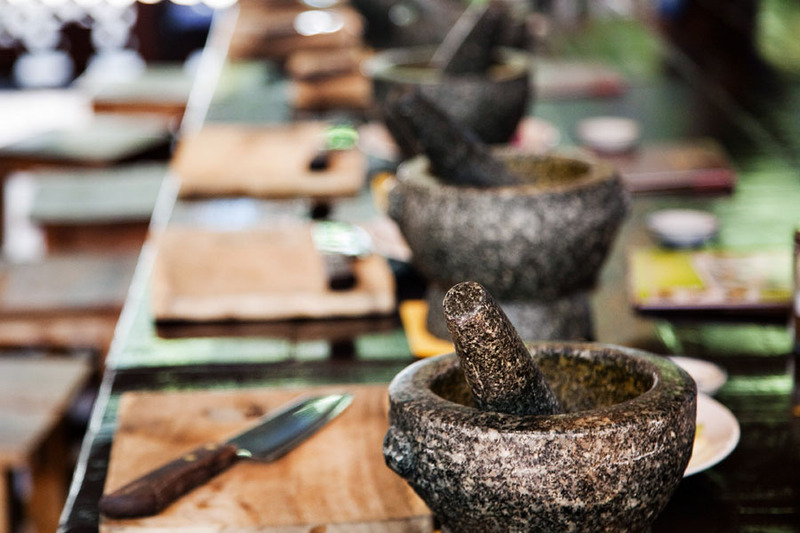 The special thing about this cooking school is that they use a typical outdoor Thai style kitchen. Most Thais (and Asians in general) have very small and limited kitchens within the home and expansive outdoor kitchens adjacent to the home. This is because the high heat, resulting smoke and amount of oil required to stir fry makes it a near impossibility to do indoors. 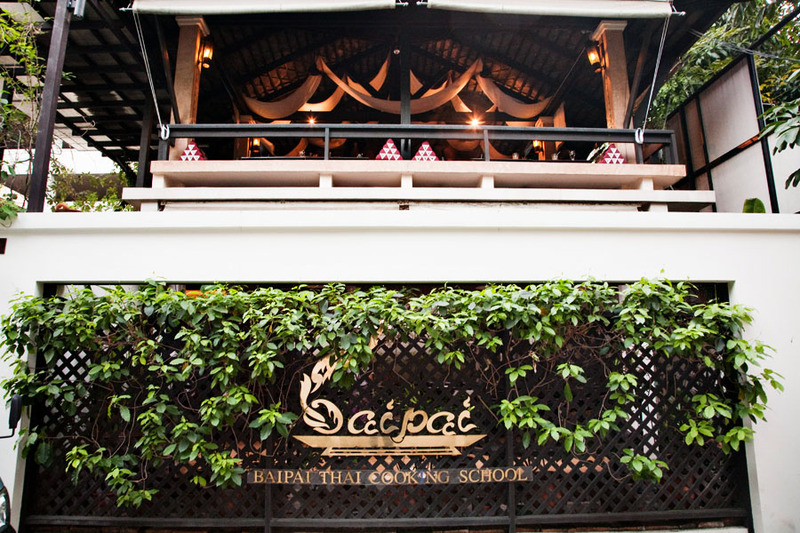 The Baipai kitchen is set in a charming little Thai house in a quiet part of town. As the chef leads you through recipes the wind whistles through the palm trees and geckos croak. It’s a special treat to enjoy the process of cooking and nature at the same time. We made several dishes that day…preparing them as individual courses and sitting in between dishes to enjoy what we had just prepared. It ranged from the more simple things like Som Tum Thai (Green Papaya Salad) and Goong Ma-Kam (Prawn in Tamarind Sauce) to Chicken in Pandanus Leaf and Ganag Pehd Ped Yang (Roasted Duck in Red Curry). We learned everything from the basic practices of cleaning shrimp (a good refresher), how to properly use a pestle and mortar, how to tie pandan leaves, and even specific regional styles of preparation like separating coconut milk to extract the fullest fat cream part. Between the new techniques we learned and the relaxed feel of the tropical, outdoor kitchen, it was a really lovely way to spend the day. Since some of you may be far from Thailand, we wanted to share some recipes with you and have picked a couple where we think you will be more likely to find the ingredients in most large city supermarkets. Enjoy! If there are no Pandanus leaves available where you live, you can also substitute a corn husk or simply put on BBQ skewers. Further, instead of chicken you can substitute shrimp or fish. Dipping sauce – 1 tablespoon sweet soy sauce sprinkled with white sesame seeds. Pound coriander root, garlic, black pepper seeds and lemongrass together. Ideally in with a mortar and pestle. If not then in a bowl with a heavy wooden spoon. Transfer into a mixing bowl with chicken, sugar, soy sauce, oyster sauce, sesame oil, white sesame seeds and mix well. Leave to marinate 1 hour. 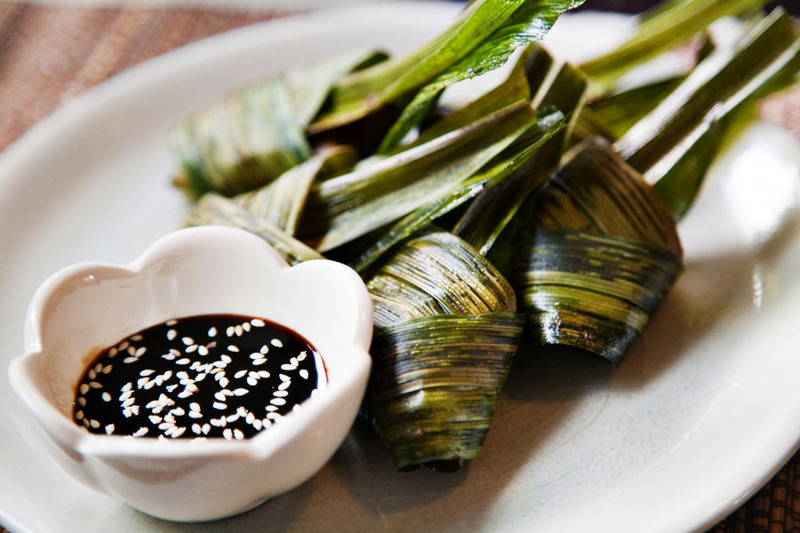 After 1 hour, wrap each piece of chicken in a pandanus leaf. Submerge the bundle of chicken, completely wrapped in the leaf into hot oil. Cook for 3-5 minutes. 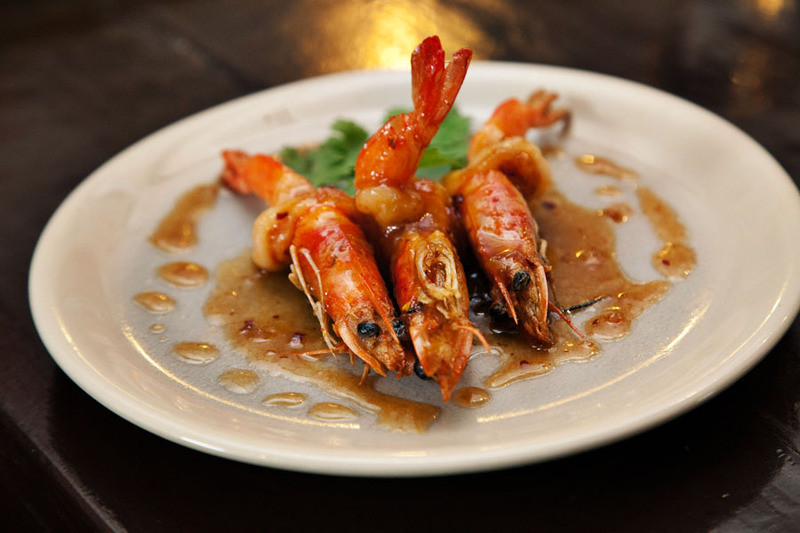 To prepare the prawn, remove the sharp pointy part of the tail, then cut down the middle of the prawn. Pass the tail backwards through the hole in the middle. This results in a more evenly cooked and elegant presented prawn. Prepare prawns as indicated above and coat them with flour. Deep fry until golden brown (1 minute). Set aside and drain on paper towel. Prepare tamarind sauce by stir frying sliced shallot in oil until crisp. Add palm sugar, tamarind paste, fish sauce and water. NOTE – palm sugar must be added 1st! Stir until sauce is thickened. Remove from heat. (Sauce will actually keep for 1 month if you wish to prepare in a larger batch to save). 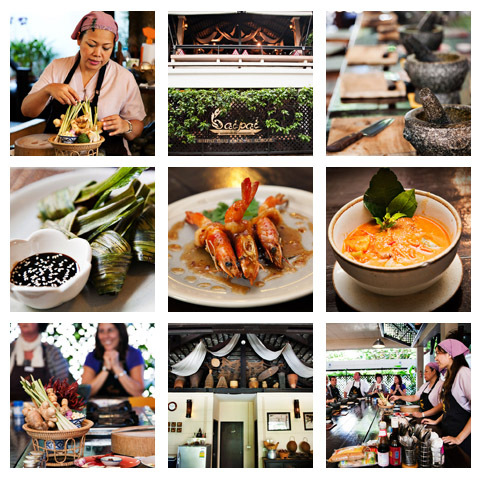 Love cooking schools, love Thailand, and love these photos! You’re a pro!